President Brigham Young (1801-1877) was part of the first Quorum of Twelve Apostles of this dispensation, called and ordained in 1835. 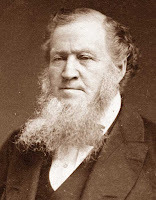 He served as the second Church president, succeeding Joseph Smith, from 1847 until his death in 1877. "Without revelation direct from heaven, it is impossible for any person to fully understand the plan of salvation. We often hear it said that the living oracles must be in the Church, in order that the kingdom of God may be established and prosper on the earth. I will give another version of this sentiment. 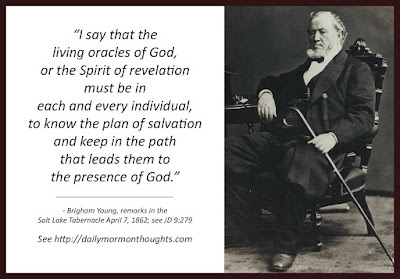 I say that the living oracles of God, or the Spirit of revelation must be in each and every individual, to know the plan of salvation and keep in the path that leads them to the presence of God." The concept of "living oracles" is an important one in the Church of Jesus Christ. An "oracle" is defined as "a priest or priestess acting as a medium through whom advice or prophecy was sought from the gods in classical antiquity." In a religious context it refers to a prophetic voice, a person chosen as the spokesman or revelator for God's instructions to men. The Church today proudly teaches the importance and sacred gift of having a "living oracle," or a current spokesman for God, as the leader on earth. So we must each possess that gift of revelation as "a well of living water, springing up unto everlasting life" (D&C 63:23; see also John 4:14). 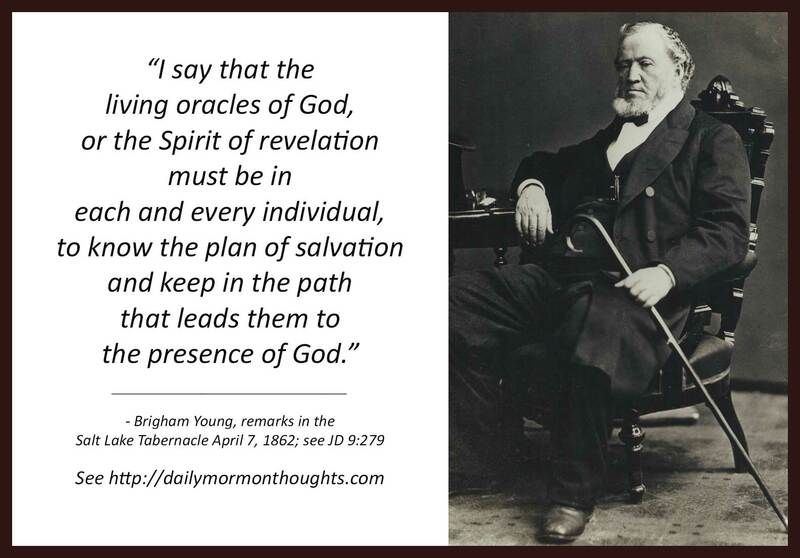 We become our own oracle as we are worthy to receive the direction and inspiration from heaven to help us "know the plan of salvation and keep in the path that leads [us] to the presence of God." This is a sacred responsibility for each of us to seek, obtain, and treasure!